Last week was my one month anniversary of the 8 week protective style challenge. The day before I decided to prepoo my hair with ORS Hair Mayo, which is a protein conditioner. I left it in overnight, which I don’t think was the best idea because the directions didn’t say I should do that. But I am still new to this natural hair journey and I was bound to make a mistake…or two. Although I left the mayo in overnight, I was really paranoid about my hair falling out in clumps so I washed it out first thing in the morning on wash day. Every month, the care of your hair is a little extra. You have to wash it with either a clarifying or chelating shampoo,deep condition, hot oil treat, and L.O.C. I did all of the above. 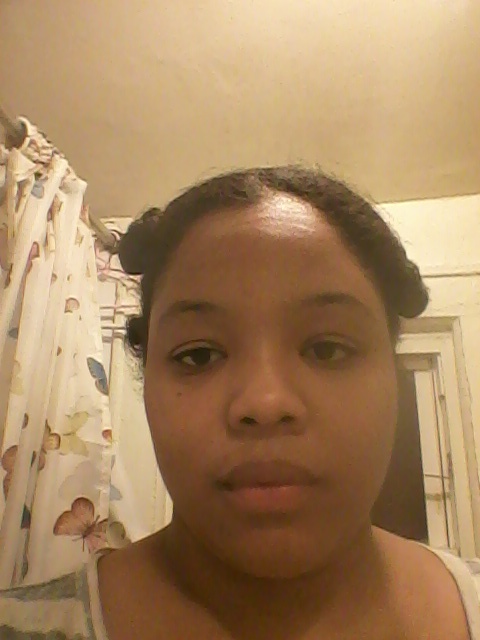 I used ORS Clarifying shampoo and deep conditioned with ORS HAIRepair Nourishing Conditioner. I did a hot oil treatment, washed it out after 30 minutes, then shampooed again. I put my hair in 4 bantu knots and let it air dry overnight. The next morning, the ends were a little damp and the rest was dry. Once the hair was completely dry, I put the bantus back in because I was feeling them. A few days later, I put my sock bun back in. I’ve completely abandoned my phony ponytail. I pulled the bun low and off to the side. 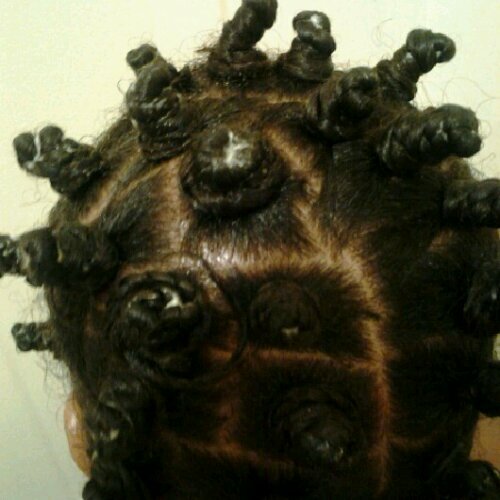 My hair in bantu knots, not the most elegant but it will do! Week 5’s hair day was pushed back two days because I had to have work done in my bathroom. I prepoo’d with ORS Hair Masque and the following day it was business as usual. I mentioned before that I was concerned about breakage and I found a regimen that I’ll be starting after this challenge is over. If the new regimen fails, I will book a hair consultation at Miss Jessie’s Hair Salon.I’ve seen Miss Jessie’s hair products advertised in beauty supplies stores all over my neighborhood but I never knew there was a salon. I found it at the forums at CurlyNikki.com. It’s a $75 non refundable fee for the consultation and you get advice on what will be best for your hair. If you want them to do your hair right then and there, they will or you can come another time to get it done. If that doesn’t work for me, the big chop will still be in the back of my mind. Week 6, I used a different deep conditioner. 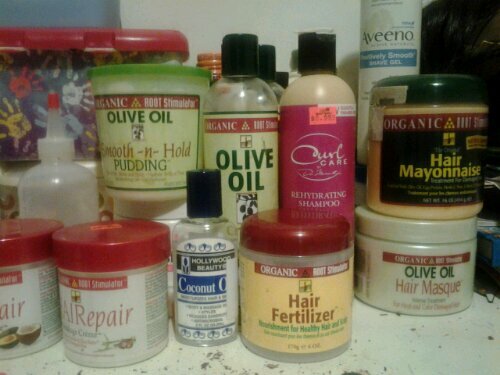 It was ORS Replenishing Conditioner and I’v ejust fallen in love with ORS products but alas, I’ve realized I’m a product junkie, lol. But since I’ve been doing the challenge, I wanted to have an array of products to choose from and Im done buying products..at least until what I have runs out.The thing I”ve learned is that because I have breakage issues I’ve only been L.O.C.ing with my anti-breakage creme and nothing else. I received my copy of Better Than Good Hair by Nikki Walton and finished it in three days. It gave a wealth of advice and it pushed me to instead of doing a big chop, I’ve decided to trim my split ends. I know it seems a little counterintuitive to do that after doing all the work for 2 months to gain more length only to cut it off. But the main goal here is always the same: healthy hair! My products! Don’t judge me! Laura Berg, a certified teacher and founder of My Smart Hands–an agency that offers information and sign language classes for hearing toddlers and parents–explains that sign language helps to bridge the two hemispheres of the brain. This gives children two ways to access a word and its meaning. Now, I don’t much about ASL except the alphabet and I have been thinking about learning sign language for myself for awhile. Teaching Amani ASL will help with her vocabulary skills and provide a bonding experience for her and I. It may even give her the advantage in school that I would like her to have. However, I will not get into that until after she has a decent handle on basic stuff. As far as Math goes, it’s always been my worst enemy, but I think I can handle first grade Math. She can count from one to ten with ease but sometimes has trouble recognizing how they look and any number with the word ‘teen’ at the end of it is also hard for her. I want to start her off slow with that and we can practice with a simple worksheet.Once she’s mastered it, then I’ll incorporate some games to keep her focused. I still don’t have a scheduled time for learning time but I’m going to implement one and stick to it as best I can. I wanted to include structured lessons, games, and free play. I’m going to set up a writing center for her and even a wall for her drawings/ paintings.She’s also talented so maybe I’ll even host a talent show for her a few times and have our family be her audience. I can’t wait to start because I can also flex my own creative muscles of which I have many of.Her learning activities will extend beyond home too. I encourage all of you to consider your own child’s futures and get involved with their education before they even hit the school house.They will appreciate it and they’ll appreciate you for doing it for them. You’re 18 years old now and you’re the mother of a 2 month old child. You’ve become a statistic, my dear. You wanted to grow up so fast to prove to your mother that you were not stupid. You let a man seduce you with his kind words and attentive ear. And now you’ve become the cliche: black, on welfare, teen mom. Not to worry though, for your mother is coming to rescue you from your verbally abusive aunt. She will take one look at Amani and fall completely in love with her. You will move back in with her and it will take her a long time to trust you and sometimes you will still lie to her but eventually you both will come to have a stronger relationship than ever before. You are still ambitious and you refuse to stay on welfare your whole life. You know that you have many talents and you also want to show Amani that obstacles, no matter how great or small, can be overcome. Stop beating yourself about becoming a teen mom. You are a good mother. Your baby loves you and your mom is supportive. Yes, your aunt will try to continue to slander your name, but ignore her. She’s just mad that she won’t be getting money for you anymore. So much is going to happen in the next five years. You will laugh,cry, and grow alot. You will learn that you are going to have to trust your mother’s intuition. Yes you will make mistakes, but you can do it and you’ll do fine. Now that I’m going to be spending time at home, I need to focus on getting Amani’s literacy, math, and reading skills up to par with a child going into the 1st grade. 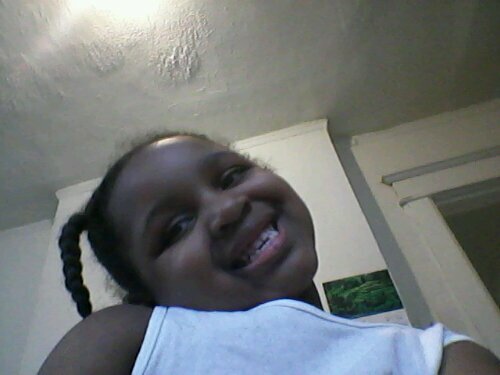 Amani is super smart and it doesn”t surprise me because she comes from a family of superior learners(hope that didn’t come out too cocky). When my younger brother and I were in grade school, we were both in gifted classes. I was always one reading grade level ahead of the rest of my class and my brother also did well. My mom is a gifted writer and avid reader as is my father so I know Amani is destined to do well. However, I really don’t know where to start with her. She uses a program right now called abcmouse.com. I like it because she can learn at her own pace and have fun doing it. She needs more structure,though. In the next couple of weeks,I’m going to set up a learning sysytem for Amani. I want it to cover everything she’ll need to know for first grade plus extra stuff that will be ahead of her grade level. I am going to mostly be using teachmama.com as a guide and what I like about that site is that it gives a whole bunch of other resources for ideas that u can use in your own lesson plans. I will share everything I come up with in case you guys want to try it and let me know how it works out for you and if u made any changes, I want to know those to. Together, we can prepare our children to compete with those in private schools. Remember, it takes a village…! I started my hair challenge with an hot oil treatment using castor oil. I wrapped my hair in a conditioning cap and wrapped the cap in a hot towel. After half an hour I washed it out and shampooed using a sulfate free shampoo. Sulfate can be hard on hair so I don’t use shampoos that contain sulfate as my weekly choice. I applied the faux ponytail which protects the ends of my hair. After a week, I got tired of the ponytail so I took it out , greased my scalp with castor oil (which is also a requirement of the challenge. I have to do it every week.) I washed and conditioned, L.O.C’d and put in a sock bun. 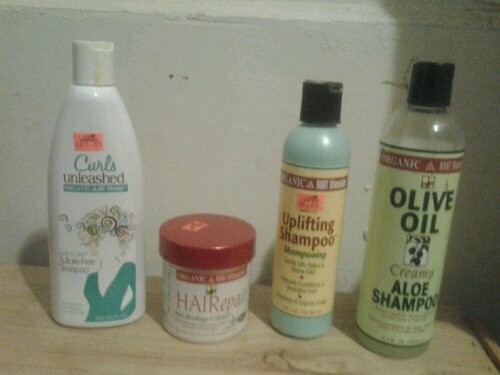 The castor oil feels heavy on my hair so all the other products I use I try to make sure they are light. I managed to stay away from hair gel for the last four months or so and have substituted it for ORS Smooth N Hold pudding. It’s ideal for ponytails but doesn’t do much for my stupid puffy new growth. I try to smooth it out as much as possible but to no avail. I have fallen in love with Organic Root Stimulator products and I just found out they have a line for little girls (yay,Amani! ).I miss my Profectiv products and as soon as I figure out which ones suit me the best, I’ll incorporate it into my regimen. In my third week, I found a new wash routine thanks to Aisha of myfroandi.com. I followed the routine pretty much to the letter but changed it a little so that it still fell in line with the guidelines for the challenge. 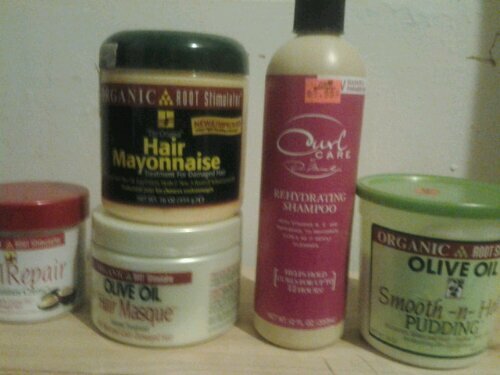 I like washing and applying products to my hair in sections. I usually do it in 4 sections and I can give each section the attention it deserves. Two things that are still bugging me are the rough patch in the middle of my hair and breakage. The patch is a coarser texture than the rest of my hair and it seems to constantly stay dry. Within the last few weeks it’s become a little more manageable and moisturized. I’ve had breakage problems for as long as I can remember. I can’t tell you how many times I’ve clogged my tub drain with my hair. But since I’ve been detangling properly (tip to root) it’s been less of a problem. I’m really excited about what the result will be like once the challenge is over. I’ve had fun using different products and experimenting with how to treat her my hair. It’s very much like me:sensitive, stubborn, but needs to be handled gently. I even tried something new with Amani’s hair. I did a bantu knot twist out. 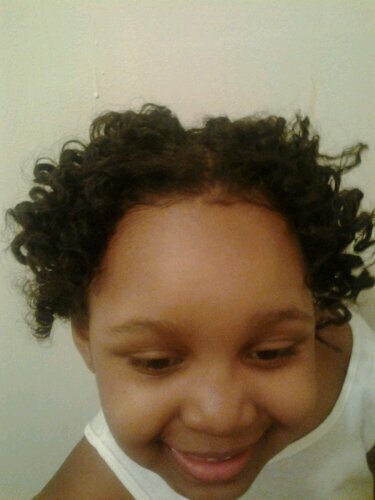 The result were nice mini like curls and her hair in the bantu knots was beautiful. After next month, I’m still debating on whether or not to relax my hair or cut it all off. I’d relax it because of the new growth and I’d cut it all off because of the split ends Either way, I’m going to have to make a decision soon. I want to be natural and I’ve learned so much about it that relaxing it would just undo all of that. Check back in with me next month as I deal with the next and last month of the 8 week protective style challenge. BTW, the way I listed the products I was going to be use every week for the challenge have changed a bit and I.ll redo it in a month. 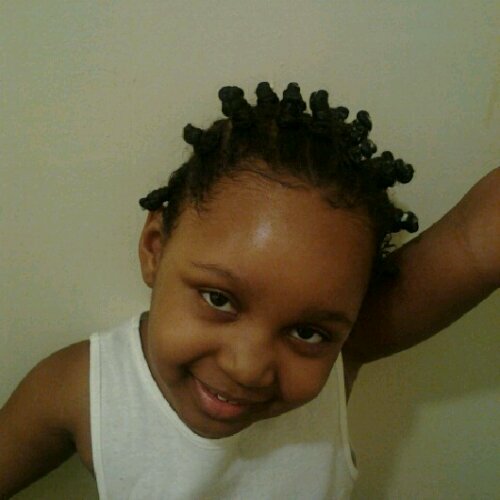 Amani and her lovely locs! I was watching the commercial for a new episode of one of Amani”s favorite shows, Victorious, and the students had to face a challenge proposed by one of their teachers.He asked them to go an entire day saying yes to everything. The commercial ended with the students saying yes to ridiculous things ( popping someone’s back pimple, smelling a funky foot,etc…) But the teacher’s challenge did strike a chord with me. Oftentimes, we go through our lives saying no. We turn down opportunities that we know will make us uncomfortable. That behavior keeps us in our safe zone while simultaneously turning down something that could uplift us emotionally, spiritually, and mentally. If we take risks, something bad may happen but if we don’t take risks, nothing happens. When it comes to following your dreams, it’s all about trial and error. You try one thing, maybe it doesn’t work, and you keep trying until something clicks and you strike gold. Today I want to challenge all of my mommy friends to say yes to something they would normally dismiss. I know you’ve got more than enough on your plate with kids,work,school, and household duties but I’m talking about saying yes to something that is just for you. It will be scary and hard but I’m here to encourage and support you. I’m not just talking the talk either. I too am saying yes. When I had my 9-5, I was proud of myself for being able to give my daughter a little financial stability. I love most of my coworkers and learned a lot. But I wasn’t happy because I wasn’t passionate about my job. Hurricane Sandy, though it bought a lot of destruction, also pushed me to do what makes me happy. So I’ve given up my job and I’m saying yes to possible financial instability, possibly being rejected by the blog and writing community but I’m also saying yes to a happier me!